If ever there was something that needed to be posted about the insanity that is our public school system, the above work sheet is it. My nephew brought this home because he has to study it for a test at school. So far so good. 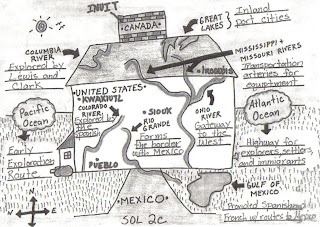 Yet why a house instead of a map of North America you ask? Why, because the school believes that this is easier for kids to learn geography. No, wait. You're saying to yourself: "this must be for kindergarteners or first graders to ease the lil' dears into geography". Nope. Try FIFTH GRADE!!! First it was the partial products nonsense that completely screws up learning basic multiplication, then we were told not to worry because my nephew really has no need to learn how to spell since he'll be using Microsoft Word (WTF?!? ), and now this BS. The deliberate dumbing-down of education in public schools is just criminal. John, I linked this at Innocent Bystanders. If kids can't find America on a map, I guess we know why. They've never seen a map. Mind you, my sister's high school class "Social Justice in Literature" bothers me more. I'm glad I'm 57 and not in good health. I don't want to be around to see the results of our current education system. I shudder when my mind tries to grasp it. Michael: Thanks for the link. I commented some over there. John: Great name btw! The state of our schools should make all of us shudder and greatly concerned for the next generation. I hope your health improves.